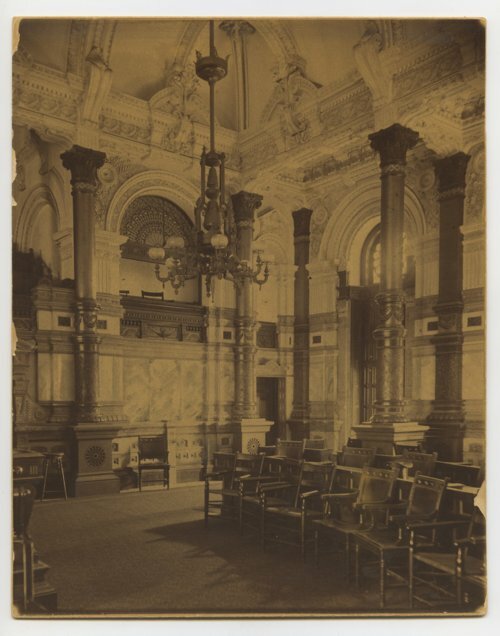 This sepia colored photograph shows the chambers of the Kansas Senate in Topeka. Built in 1866 as part of the east wing of the Capitol, the room features cherry wooden desk and twenty-eight massive bronze and copper columns. The columns were hand-cast in Italy and were designed with air vents which allowed heat to circulate throughout the room. Today, forty senators occupy the chambers when the legislature is in session from January to April.